Dozens of parents and teachers protested the cuts and tax increases. The school district began with a $43.62 million budget gap. It was later reduced to $22 million. School officials cut or scaled back programs like purchasing books, intervention to help students struggling in math and reading, SAT preparation, textbook purchases, art and music, and science lab upgrades before slashing staff. School officials had said as many as 150 teachers could lose their jobs. On Tuesday night, the district provided details of the job cuts. 120 teachers, 29 supervisors, 23 vice principals, 11 secretaries and security staff, and 5 directors will be eliminated. Also 44 vacant position will be axed from the budget. “Having 30, 40 students in a classroom is just unacceptable,” said Lynn Schweighardt, a nurse at School 21. There could be 40 or more students per class in September, said superintendent Eileen Shafer. Last year, one of her sons went half of the school year without a science teacher, said Alford. During the eight years of governor Chris Christie the district was underfunded $280 million, said the superintendent. 526 staff members were laid off during that time. “We’re in a war. Our students are the ones losing,” said John McEntee, Jr., president of the teachers’ union, Paterson Education Association. He urged the superintendent to shut down the school system to march in government offices in Trenton for more funding. Parents and teachers blamed the layoffs and program cuts on the state. The state funds 83-percent of the $526.45 million budget. This year, the state provided $439.25 million, up $13.23 million from the previous budget year. Shafer said the $13.23 million increase was gobbled up by charter schools. The district is transferring $63.8 million to fund charter schools, up $9.42 million from the last budget year. She blasted charter schools for worsening the district’s financial problems. “Our children don’t come in little cases of 24 because if they did, we could eliminate a teacher, maybe we could eliminate a building – and gas, electric, and heat. But that’s not how it works. A couple of children from each school or different grades go to charter schools. So, there’s no savings for us,” said Shafer. Frustrated school board members expressed their anger at the cuts. Castillo said the state government is returning local control and failing to provide the funds and resources needed to educate students. 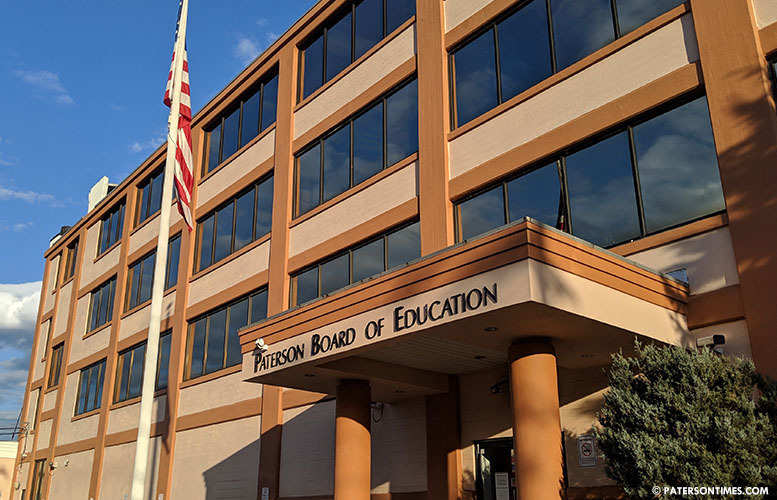 Members of the school board and the superintendent said the budget is not adequate to provide students a “thorough and efficient” education as guaranteed by the New Jersey Constitution. “When we don’t provide a thorough and efficient education there are consequences. Children do not become productive. They do not become good citizens. And then we have to deal with it one way or the other,” said school board member Kenneth Simmons. “You can’t teach if you don’t have teachers,” said longtime school board member Jonathan Hodges. The school board, fearing the state will re-take local control, reluctantly approved the preliminary budget. “We’re going to have to operate on several different tracks,” said school board member Manny Martinez. The board also approved a resolution to raise taxes by 14-percent and another to direct the superintendent to seek more state funds for the district. “It’s going to drown me. I’m giving and they are taking. I’m getting nothing in return. My streets aren’t paved; my son, who is in seventh grade, doesn’t know how to write cursive because it’s not taught in schools,” said Gonzalez of the tax increase. Gonzalez pointed out the municipal government has raised taxes by 2-percent and has raised sewer fees. Mayor Andre Sayegh said he has called governor Phil Murphy’s office to lobby for more fund for the school district. The school board is hosting a public hearing on the budget on May 7th. A final budget adoption vote is scheduled for May 14. No. I like to think for myself. The school district should give control back to the state since clearly, we are locking leadership in our finances area. I would suggest to the mayor to call Trenton and talk with the State Doe and the governor office . As for our BOE member they simply don’t care, this job is a stepping stone for future career advancement/ just a resume builder. This is a kick back position. Please vote all of them out time for new leadership . I am truly sorry for our kids .